Recently in my project, I had a requirement where I needed to assign security privilege to all the roles in the system to a custom entity Programatically. Let’s see how we can achieve the same. The name of the privilege records create would be in the format of prv<privilege><entitylogicalname>. So if the logical name of the entity is crmtr_testentity1 then for create privilege, the privilege name in CRM for Create would be prvCreatecrmtr_testentity1. The code below would fetch all the privileges for the entity crmtr_testentity1. You need to implement the method GetOrganizationService() which would return the OrganizationServiceProxy instance. As you could see, all the eight privileges for this record has been returned. Now for demo purpose let us give Marketing Manager security role User level create and business unit level for Write privilege. The code below does the same. 1A7F9E89-8283-E311-8E04-463500000031 is the Guid of the marketing manager role. Looking at the code we find that we are using the AddPrivilegesRoleRequest to do the same. The code is pretty simple and self expalnatory. The access level is provided by the PrivilegeDepth enumeration. Once the code oi executed we now have User level create and Business Unit level write on the Test Entity 1 for the Marketing Manager security role. SOAP Logger is used to find the raw XML request that is sent to CRM for each message. It is just a helper library that ships with the SDK to find out the raw xml request. through OData you cannot do this. I generate the xml request and I sent the XmlHttpRequest, but it seems to be an internal server error. 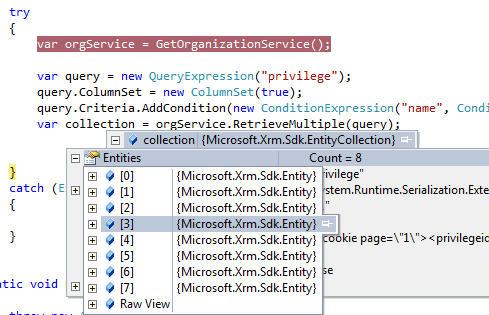 Once I go through the XML code the privilege related things are only in the XML Response not in the XML Request generated.